September 12, 2012 - Page about the Big Slackwater restoration opening ceremony - which will take place October 13. October 14 - You can listen to a story about Eva the Mule on this page. Real audio file, Windows Media file. June 1 - Western Maryland's historical library has a new page about the Canal. April 23 - The Yockatomac Trek is a resource for planning your bike trip from Pittsburgh to Washington. April 6 - Captain Pearl R. Nye: Life on the Ohio and Erie Canal - new online Library of Congress exhibit. October 13 Link added to a little video of the path down from the SHepherdstown Bridge to the towpath. February 9 - Announcement of Canal Awareness Day in Poolesville on May 7. January 21 - There's a page starting for GPS coordinates of points of interest along the canal. The C & O Canal is a 184 mile long National Historical Park. It begins in Washington, D.C. and follows the Potomac River to Cumberland, Maryland. Construction of the Canal began in on July 4, 1828, the same day the Baltimore and Ohio Railroad was begun. Construction eventually stopped in 1850 when it reached Cumberland. The original idea was for it to go much further west, but the competition from railroads had not been foreseen when the canal was originally planned. It finally began making some profits in the 1870's but at the end of the next decade, a massive flood caused the Canal Company to go into receivership to its rival, the B & O Railroad. The railroad operated the Canal for several decades until another devastating flood in 1924 at which time the Canal was closed for good. In 1938, the 184 mile long stretch of property was acquired by the Federal Government for $2 million and put in the domain of the National Park Service. The Service decided it would make a perfect Parkway - an attractive approach to the city of Washington. However, such was not to be. Justice William Douglas of the Supreme Court reviled the thought of the destruction of the beautiful river corridor. He challenged the editor of the Washington Post, who had come out in favor of the proposed construction, to walk the entire towpath and then decide whether he still thought the road project idea was a good one. The editor agreed to Douglas's proposition, and after completing the hike came out with an editorial in favor of saving the natural beauty of the river and dispensing with the highway. Public opinion turned towards keeping the land natural, and in 1971 it was designated the Chesapeake and Ohio Canal National Historical Park. During the course of its 184 miles, the canal had to climb a little over 600 feet. This was accomplished through a series of 74 liftlocks, each of which would raise or lower a canalboat about 8 feet to the next level of the canal, a procedure which generally took about ten minutes. Besides liftlocks, a number of river feeder and guard locks also had to be constructed. These locks allowed water from the river to flow in and out of the canal as needed. The guardlocks also served to protect the canal during flood periods. Other structures that had to be built as a part of the canal were culverts and aqueducts. To enable the canal to cross relatively small streams, over 150 culverts were built. The crossing of major streams required the construction of 11 aqueducts. One of these, the Monocacy Aqueduct, at mile 42, is thought by many to be the most beautiful feature of the canal. Constructed of pink and white quartz sandstone quarried from the base of nearby Sugarloaf Mountain, the aqueduct withstood Confederate attempts to blow it up during the Civil War. More recently, it suffered extensive damage during 1972's Hurricane Agnes. While it underwent extensive repair work to save it following that flood, it is still in great need of further major repairs if it is to be saved for posterity. A joint campaign to save the Monocacy is in the works. The boats that plied the Canal typically carried cargoes of coal, flour or grain, and made the trip from Cumberland to Georgetown in four or five days. They used teams of two or three mules, working in six hour shifts. The canalboats generally had crews of five, often all members of the same family. If there were young children living aboard the boats, they would be tethered to the boat to prevent accidents. Parts of the Canal have been rewatered and other towns along its path are hoping to do the same in the future, but in the meantime, much of the bed of the Canal is filled with trees and shrubs. Since the Canal has been out of operation since the '20's, some of them have had time to reach quite a considerable size, especially the Sycamores. You can also see smaller trees such as Pawpaws (the fruits of which may someday soon appear in local supermarkets!) and bushes such as Spicebushes, which are very noticeable in the early spring with their small clusters of yellow flowers that appear before the leaves. These and many other trees and shrubs cause countless visitors to the park to ask: "How did the boats get through the canal with all those trees there?" 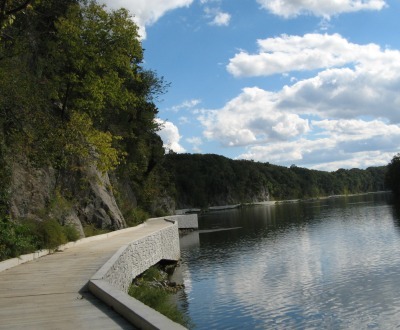 The Canal Towpath is now a very popular spot for walking, biking and horseback riding. And in Georgetown and at Great Falls, you can go for canalboat rides. Note: This is a different guestbook than the one on the Appalachian Trail page.